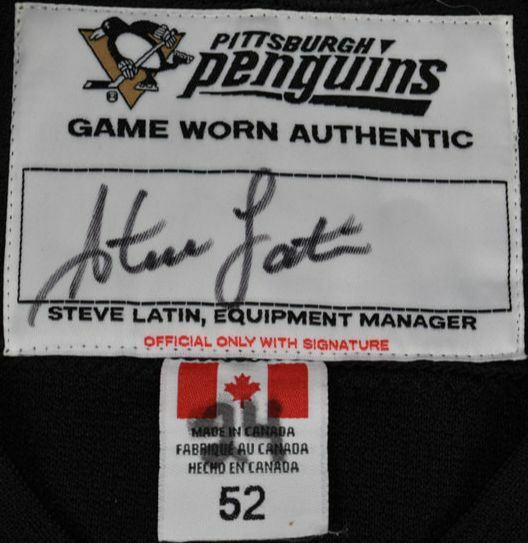 For the first time since 1986-87, the Penguins wore jerseys by a different manufacturer than CCM during the 1996-97 NHL season when Starter became the official jersey manufacturer of the Pittsburgh Penguins. The Penguins Alternate jerseys - the gray mid-sectioned style which was introduced on January 27, 1996 - were worn for the second consecutive season. The Starter logo (S with Star and STARTER underneath) was embroidered on the back right hemline with a black logo on the Home (white) and Road (black) jerseys, and a white logo on the Alternate jerseys. The Starter logo was sewn to the left of the the National Hockey League shield logo. The inside neckline of each jersey featured the Center Ice Authentic Collection / Mise Au Jeu Collection Authentique tag above the Starter manurfacturer's tag which were both sewn above the size tag. Inside the side seam was a manufacturer's washing instructions tag with the place of manufacture as Berlin, Wisconsin. The Penguins' Set 1 jerseys were a heavy knit material while the Set 2 jerseys were made of a lighter mesh material. The Alternate jerseys were made of a tighter air-knit material. ​PenguinsChronicles.com obtained and marketed the Set 1 Road (black) jerseys while J&J Distributing of Ellwood City, PA purchased and marketed the Set 1 Home (white) jerseys.